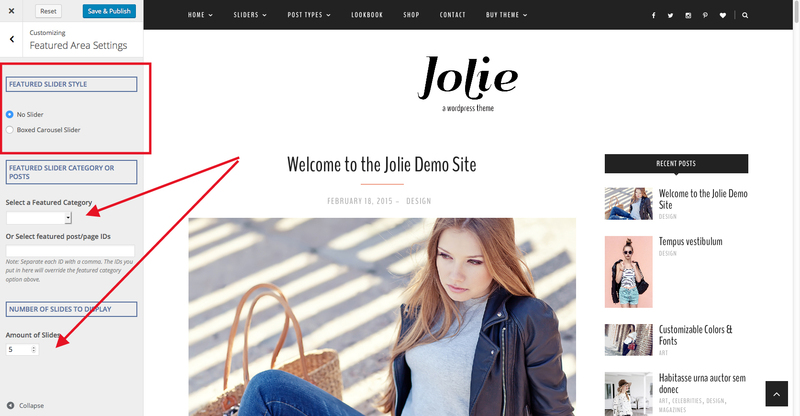 Please note: This FAQ Article applies only to the Jolie Lite WordPress theme by Georgia Lou Studios. Whether you're brand new to WordPress or would just like a quick lesson on the basic theme features or your new theme, you're in the right place! Below, we'll go through a number of how-tos regarding standard theme functions, from installing the theme to setting up your sidebar and more. 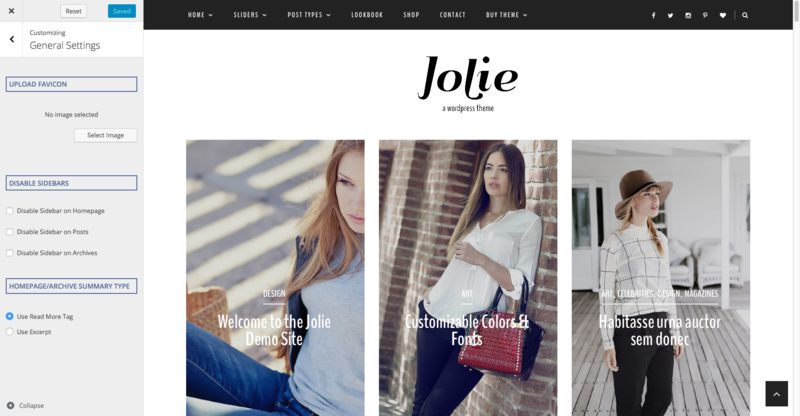 So you've downloaded the Jolie Lite WordPress theme by Georgia Lou Studios & you're ready to get started -- great! When you download the theme from our website, you will receive a .zip file - "jolie-lite.zip". Important: DO NOT unzip this folder! This particular .zip folder should remain zipped. 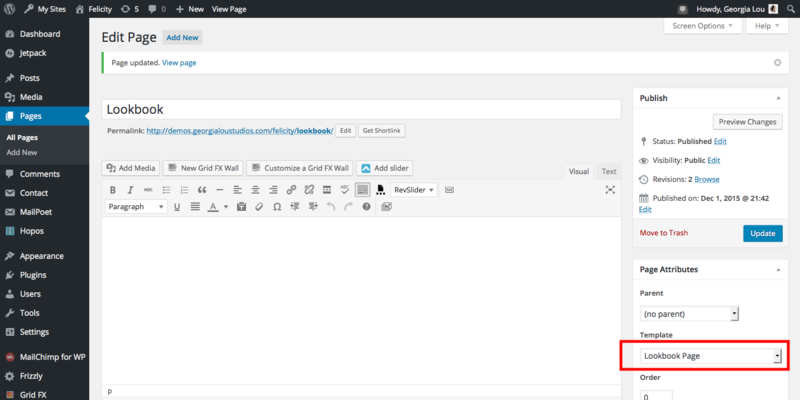 Within your WordPress Dashboard, navigate to Appearance > Themes. Click the "Add New" button at the top-left of the page > Click the "Upload Theme" button at the top. Click "Choose File" > find your zipped theme file on your computer > Click the "Install Now" button. 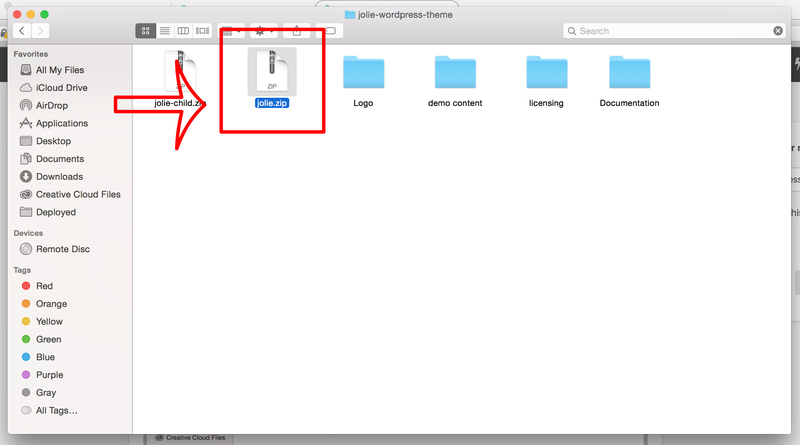 Once the theme is successfully installed on your WordPress, you can "Activate" it via the installation page or via Appearance > Themes to switch over and begin using your Jolie Lite theme! 1. Regenerate Thumbnails - We recommend whenever you change themes that you Regenerate Thumbnails. 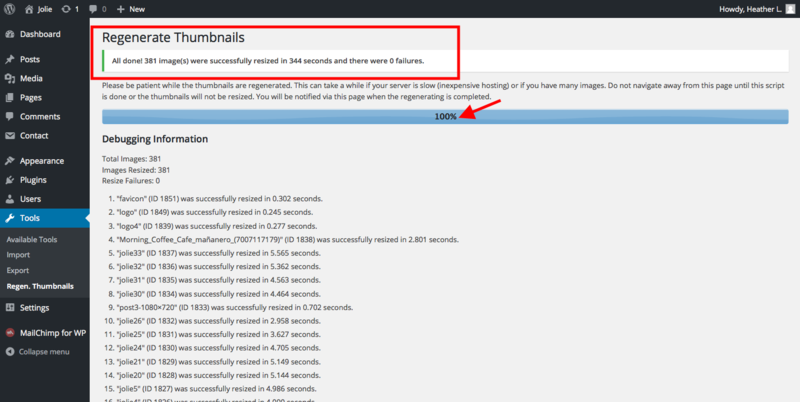 Download the Regenerate Thumbnails plugin via the Dashboard > Plugins > Add New page on your site's admin panel. Install and activate the plugin. If you need more help installing plugins on your WordPress site, we highly recommend this article: Plugins. If your site has existing content, it's a good idea to regenerate your thumbnails whenever you change themes to prevent blurry images due to incorrect thumbnail sizes. Once your have installed and activated the required and recommended plugins on your site, a new option will appear under the Tools section of your Admin left-hand menu. Hover over the Tools option and then click on the Regen. thumbnails link. Click on the Regenerate All Thumbnails button. The regeneration process may take a few minutes depending on the number of images to regenerate and the speed of your web host. The plugin will display a % process bar at the top of the window along with the number of images to be re-sized and a constantly updating list of each image that is regenerated. DO NOT navigate away from this page until the progress bar reaches 100% and you receive the All done! message. 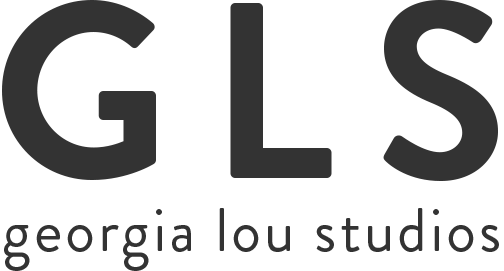 WordPress themes by Georgia Lou Studios have the possibility to create 4 different types of posts: standard, gallery, video, and audio. 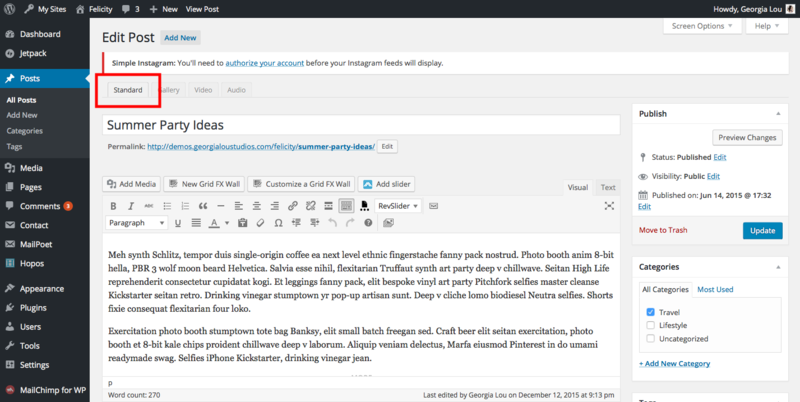 To create a post, go to WordPress Dashboard > Posts > Add New. Above your content box & toolbar, you'll see a series of tabs titled Standard, Gallery, Video, and Audio. Select whichever tab you'd like your post format to be in. Each tab will give you different input boxes depending on the content you'd like to add. A standard post is the default post type. 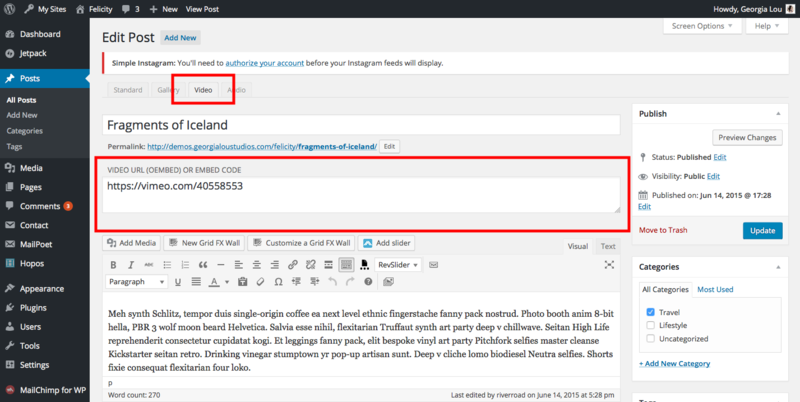 You can add text and images to your post using the tools and content box. 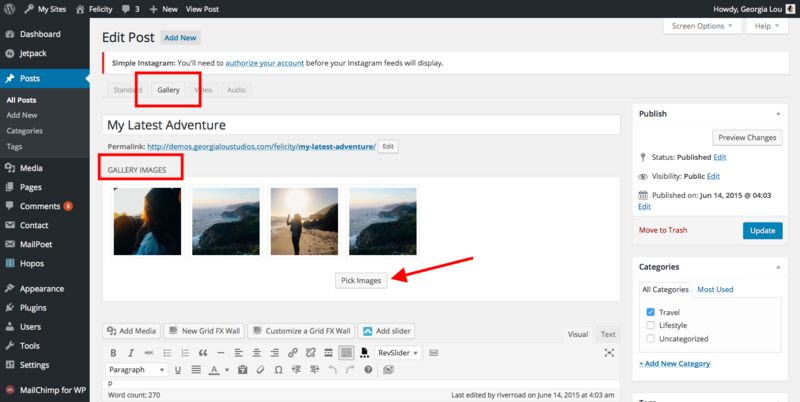 A gallery post allows you to create a slideshow-type gallery at the top of your post. After clicking the "Gallery" tab to choose this post format option, click the "Pick Images" button within the "Gallery Images" box that has appeared. Select whatever images you'd like from your WordPress Media Library or upload new images to add. A video post displays a video at the top of your post. You can share videos from nearly all video hosting sites, such as Vimeo or Youtube. Simply copy & paste the video's URL, oembed code, or embed code into the special input box. When you preview or publish your post, the video will appear. An audio post allows you to share a music or audio track and displays it at the top of the post. Like the video post, simply copy & paste the track's URL, oembed code, or embed code into the special audio input box. When you preview or publish the post, the track will appear. Once you've determined your desired post format, entered your title, and added your content, remember to assign at least 1 category to your post. Additionally, also ensure you assign a featured image to the post. Once you're finished preparing your post, you can click "Preview" to preview how your post will look once published onto your site, click "Publish" to have it appear on your site, or click "Save Draft" to save your post as it is, though not publish it yet. A standard, static page is similar to creating a post in many ways, and is ideal for creating an About Me or Contact Me section to your website. To create a new page, navigate to WP Dashboard > Pages > Add New. Like a post, you can enter a page title, add content, and assign a featured image. Once you've published your new page, it will not automatically appear in your main menu. For a tutorial on adding items to your main menu, please check out this FAQ article: How do I set up my navigation menu? For more information on setting up a Lookbook page, see the section below. A category page is a dynamic page that pulls in all of your posts assigned with a particular category. You do not create a category page like you would a standard page (described above)-- a category page is generated by WordPress and can be accessed via a menu link or category link in a post or sidebar widget. 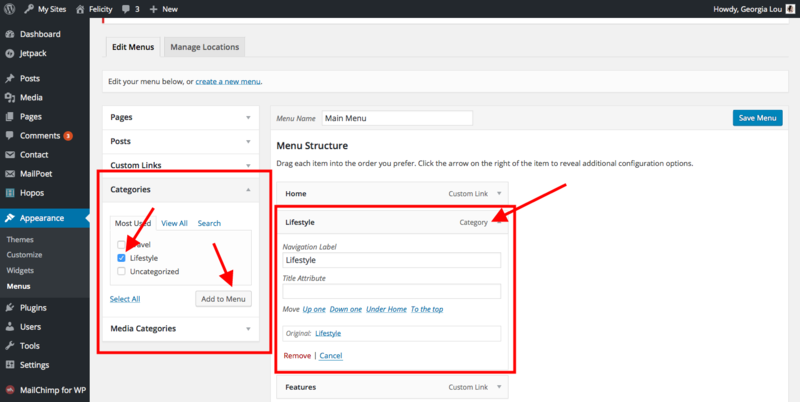 To create a menu link to a category page, first ensure you've assigned the category to at least 1 post. Then, navigate to Appearance > Menus and click the drop-down box heading titled "Categories" on the left of the page. Below, your categories will be listed. Check the box next to your desired category and click "Add to Menu". Drag and drop your new link to your desired position on the menu bar. Be sure to save. When you click on the newly-created menu item, it will take you to that category's page. For more information on creating a category page, please check out: How do I set up my navigation menu? Your homepage is the first page visitors will see when they arrive at your website. By default, the homepage will be the page that also displays all of your posts, beginning with the most recent. We call this feature the "post feed". To customize how your homepage looks, including its layout, colors, enabling/disabling the sidebar, etc., navigate to WordPress Dashboard > Appearance > Customize. Under the various drop-down tabs on the left of this screen, you'll find loads of ways to customize your homepage & website in general. For example, within the " General Settings" tab, you can enable/disable the sidebar. 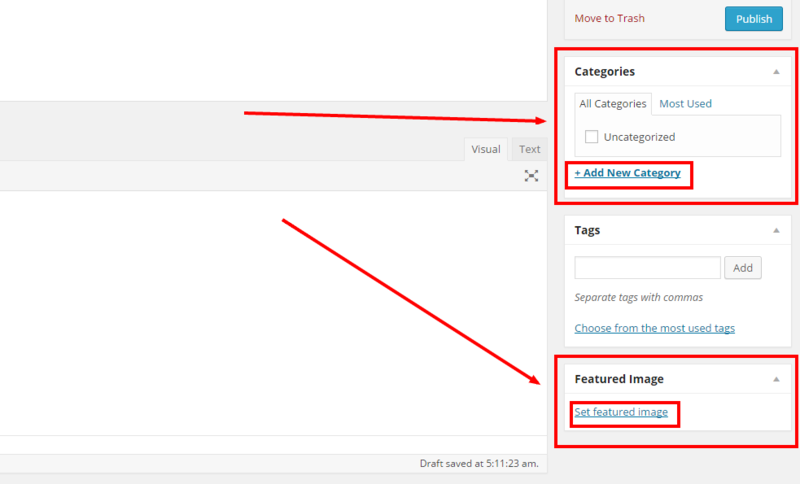 You can also choose whether to use the manually inserted "Read More Tag" or the automatic Excerpt to display a shortened version of your posts on the Home and Archive Pages. Be sure to explore the various options within this Customizer section. The live preview on the right will show you a preview of how each adjustment will visually affect your site. Setting up the themes main menu in the top-bar is quite simple! For a walk-through on how to go about it as well as more specific how-to tutorials, please check out: How do I set up my navigation menu? Assigning a featured image to your posts is very important, as the featured image is what the theme & other web functions use to visually represent the post in various situations. look at: How do I add a Featured Image? Navigate to Appearance > Customize > Social Media Settings. Here, you will see a list of social networks followed by a text input box. If you'd like to have a social icon for a particular social network, you can type in your username for that particular network. Please note that you do not need to insert your profile's URL into this box unless prompted to do so. Only your related username is required. Once you enter your username into a particular social network's text box, its icon will appear in your top-bar & footer social icon areas. If you leave a social network's box blank, the social icon will not appear in the top-bar or footer areas. Don't see your desired social network? There are tons of social media sites out there and we're unfortunately not able to include built-in options for all of them in the theme. However, don't fret! We have a tutorial written up on how to add custom icons to your theme here: How do I add social media icons? 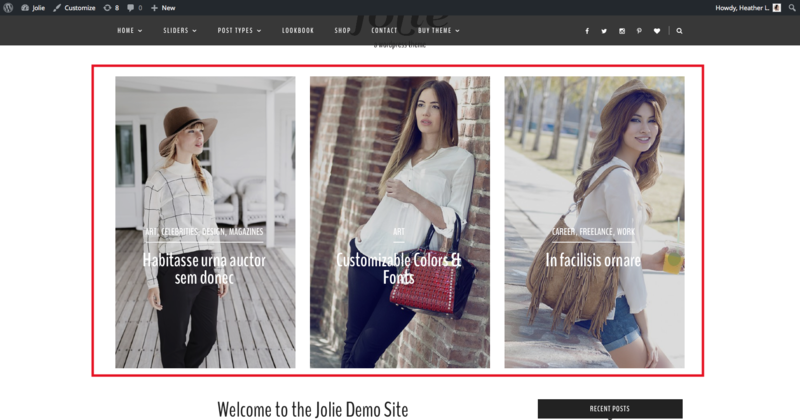 The Jolie Lite WordPress theme by Georgia Lou Studios includes an easy to setup featured area slider is a large area toward the top of the homepage where you can feature eye-catching images linking to your posts. First, ensure your posts have featured images assigned. This is the image that the slider will pull in to represent your post. For more information, check out: How do I add a Featured Image? The default setting for the Featured Slider is None. To activate the slider, navigate to Appearance > Customize > Featured Area Settings > and within the "Featured Slider Style" section, select the radio button next to the slider style of your choice. Be sure to save. 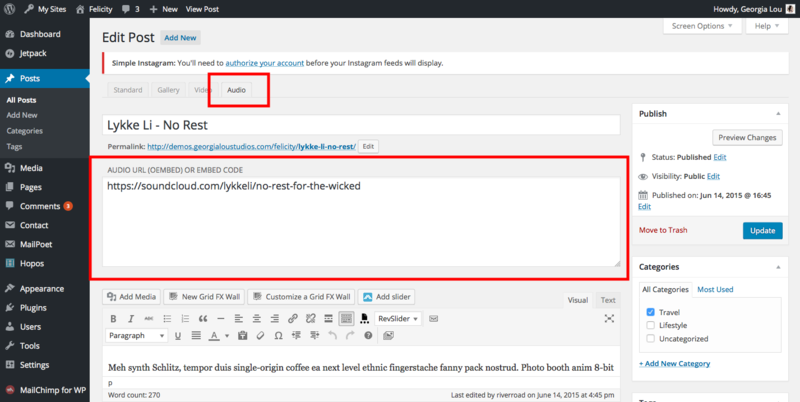 This will enable your slider on your blog page. Within Appearance > Customize > Featured Area Settings, you have 3 options for choosing which posts appear in your featured area slider. 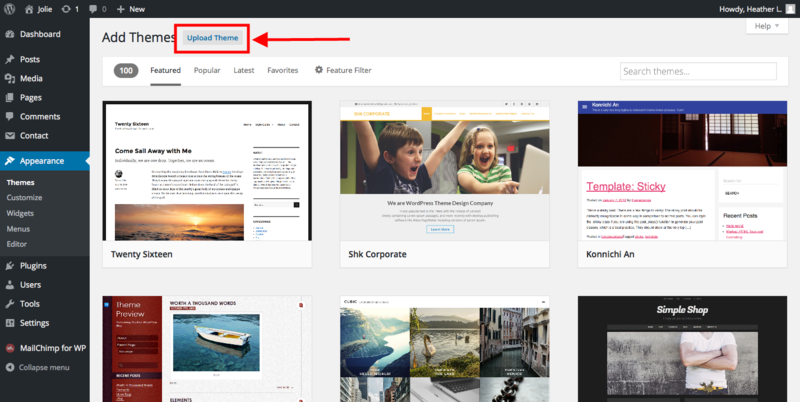 All latest posts: By default, the slider will display all of your latest posts. Posts from specific category: From the drop-down menu titled "Select Featured Category", you can also choose a particular post category to display in your slider. In the slider settings section, you can additionally assign then number of slides to display. The slides displayed will be for the most recent posts within your selected posts to display. Our themes come packaged with custom page template that can be used as a Lookbook or simple Portfolio. To create a Lookbook page, create a new page. You may call it anything you want. The page title will appear above your Lookbook images. Leave the page content empty. 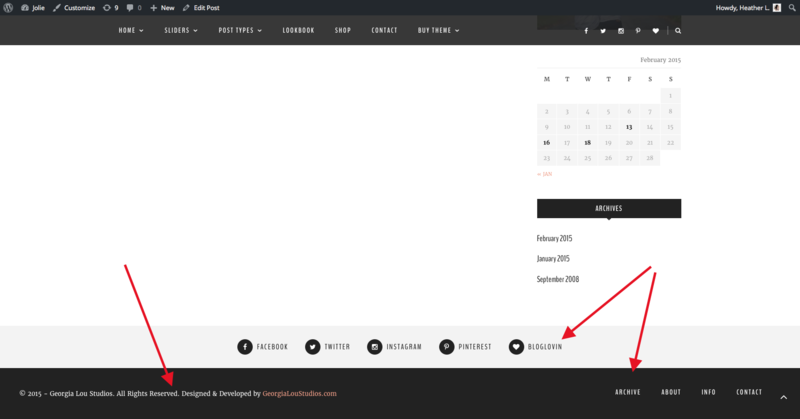 Set the Page Template setting to Lookbook from the dropdown menu. Publish your page. The default settings are for the Lookbook page to show 9 posts per page and display all your posts from all Categories. To limit the posts show in the Lookbook to a certain category or a few different categories, enter your Category slug into the Lookbook Category field. You may separate multiple entries with commas. The Category slug can be found by going to Dashboard > Posts > Categories. You may choose how many posts to show per page. If there are more posts than shown on a single page, the "Older Posts" and "Previous Posts" links will appear to allow your readers to page through your Lookbook. The best numbers to use for Lookbook pages show at most are multiples of 3: 6, 9, 12, 15, etc. Finally, you can choose to hide either or both the Post Date and Post Categories that appear on the hover overlay. Don't forget to Save & Publish your changes in the Customizer. A sidebar is a vertical content area that displays to the right of your main content/post area. You customize your sidebar by stacking up different widgets that display a variety of things. To enable/disable the sidebar on your homepage, your posts, and/or your archive pages (category pages, tag pages, etc.) navigate to Appearance > Customize > General Settings. Here, you can check or uncheck the boxes next to "Disable Sidebar on Homepage", "Disable Sidebar on Posts", etc. To add, remove, or edit your sidebar widgets, navigate to Appearance > Widgets. On the left, you will see a list of the available widgets to choose from. On the right, you will see a few different widget areas in the theme. To add a widget to your sidebar, simply drag & drop a widget on the left into the widget area titled "Sidebar". Once you've dropped a widget into the Sidebar widget area, click on its heading. A drop-down will appear and you can make any necessary adjustments to the widget's settings. From this widget setting drop-down, you can also delete the widget. 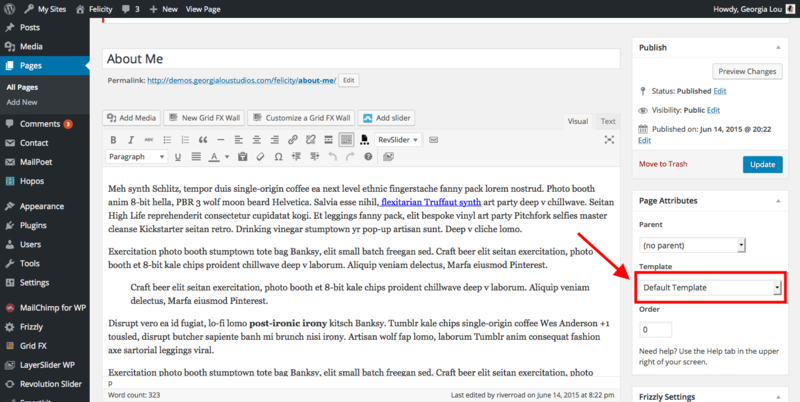 To position widgets within the sidebar, drag and drop them above or below each other. Social icons (optional) - You can include social media icons below the text. Just check the box next to the icons you would like to include. Make sure you have set up your social media IDs in the Theme Customizer according to the instructions in the Getting Started article. You can also add additional icons to the widget with the help of this article: How do I add social media icons? Make sure you Save your settings. This widget can be used in the Right Sidebar or in the Below Slider/Promo Sidebar. The footer's social icon area is directly connected with the theme's top-bar social icon area. To choose which social icons you'd like to appear, enter your username for each social network platform within Appearance > Customize > Social Media Settings. For more information, please reference the section above titled "Adding Social Icons". At the very bottom of the theme is a bar which features a text area to include copyright or disclaimer text. You are not required to include a copyright or disclaimer statement. In fact, you can type whatever you'd like in this area! Appearance > Customize > Footer Settings. To add links to the footer menu area, setup a menu under the Dashboard > Appearance > Menus area as usual. Assign the menu to the Footer Menu option. For help troubleshooting issues in our themes or to see some fun customization tutorials, check out all of our our FAQ Articles here! We have used the following opensource projects or other files as listed.